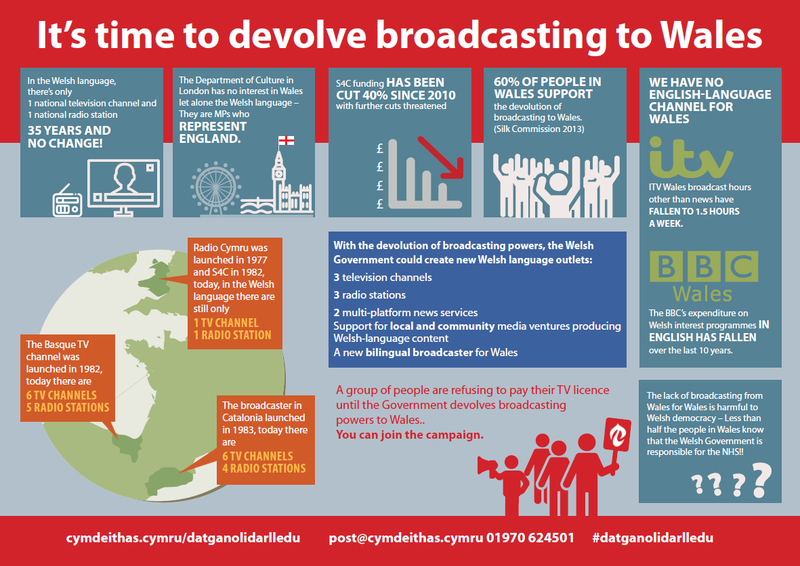 The time has come to devolve powers over broadcasting to Wales. From the lack of Welsh language presence on commercial radio, local TV and the serious cuts to S4C to the lack of content about Wales in the media, it's clear that London is not managing the media for the benefit of the people of Wales. Decisions about the media in Wales should be made by the people of Wales. It's time to devolve broadcasting. It's also clear that Wales suffers from a democratic deficit, because British broadcasters confuse people by reporting on stories which affect England only. A recent YouGov poll shows that people in Wales favour devolving broadcasting. According to the results of the survey commissioned by Cymdeithas yr Iaith, excluding those who didn't know, 65% favour devolving responsibility for broadcasting with 35% against. Please contact us on 01970 624501 or post@cymdeithas.cymru to discuss the campaign further or with any questions. Over fifty campaigners are refusing to pay their television licences as part of the campaign to devolve broadcasting to Wales. Ready to join them? We suggest you let us know using the form below, and send a message to the authorities to explain that you're taking action as part of this campaign. By completing this form, I declare that I am refusing to pay the TV licence fee until the UK Government agrees to devolve broadcasting to Wales. By completing the form, you're also agreeing that we can contact you with relevant information. We will contact you soon with more information and any further developments. We will not publish your name or other details without contacting you first to discuss the matter. When you're done, click on "Cyflwyno" to send us the form.